Without restrictive networks and high fees, mobile marketing will soon reach new highs. Part of the reality of this industry is a tendency to zealously promote particular technologies for a short period of time. Years ago, it was mobile, then it was Second Life, and now Nintendo's Wii looks like it might turn out to be the next big thing. The hype machines never stop chugging, but I believe it's time to give mobile a second, sober look. Over the past several years, there has been a lot of talk about the potential of mobile marketing, but the reality of the medium has yet to be realized. Finally, it seems like the technology has begun to catch up with those possibilities. Until now, most of the discussion on how to leverage these always-on, never-leave-home-without-them devices as an ad delivery network has been focused around SMS, which is not a particularly good example of an advanced marketing technique. But that text-centric point of view is about to change. When Apple launched the iPhone, it jolted our senses with a very new form factor and a technological backbone that makes many new cool things possible. The biggest question about mobile marketing is what it is good for. There are many applications, but in order to be successful, we need to ask ourselves what will be useful for both advertiser and consumer. Right now, the applications are, for the most part, limited to "SMS to win" and e-coupons. There is no killer app in the mobile marketing world right now beyond consumers making a call to talk to someone. Beyond a few preliminary successes and failures, I'm sad to say that mobile marketing to this point has been a non-starter. There is really nothing out there that has wowed consumers, just yet. Let's take a step back and look at things from a larger perspective. A mobile device is an always-on computer with built-in connectivity. These little computer devices are getting much smarter and more useful, improving the design with better screens, better interfaces, cooler applications and more useful operating systems. Apple took these improvements to another level, and in many ways the iPhone was less a phone than a canvas with which to do cool things. Given the public response to the launch, we can only bet that most manufacturers will soon follow suit. 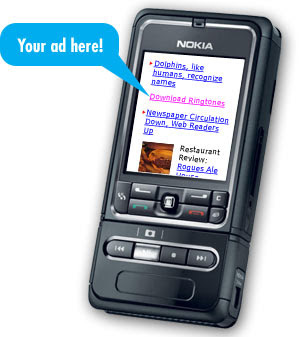 Now is the time to start thinking about mobile marketing in a compelling and interesting way. But before we start planning campaigns, we have to look at what mobile marketing really is and what things can be created. So, here we are in 2007 and web access, widgets and email responders are all ways of delivering information to people at the right time in the right place. Hyperlinks in the form of bar codes (or QR codes) can now exist in the real world, encouraging consumers to look up information, whether it is restaurant menus, product information, or any number of things. The information must be quickly and readily available, and it must be formatted for mobile, otherwise you're just wasting time. Expect that the first major retail use of mobile internet will not be product information, it will be comparative shopping. As mobile customers start realizing that their cellphone can help ensure that they'll get the best deal, retailers beware. Competitive quotes are now just a small screen away. Widgets, such as reminder lists, traffic cams, weather forecasts and a million other useful bits and pieces, are all sponsorable and brandable opportunities. As the iPhone-style interface catches on (and it will catch on), people will one day be installing these little lifestyle applications on their mobile devices and creating massive opportunity for advertiser innovation. Expect mobile to become one of your long tail marketing options to get serious consideration as we move into 2008 and 2009. Wi-Fi and Bluetooth beacons can be a great way to send someone a digital brochure via their mobile device. RFID on a phone can create a link between a company and a consumer who wants more information. Simply swipe and ye shall receive. This same technology can also be used for coupons, discounts and surveys, all of which can be viewed, completed or redeemed at the consumer's discretion. Integrating ubiquitous camera phone technology with the ability to catalogue products also brings window shopping to a whole new level. If consumers have a platform to compare products with, along with a note about that product, they have more ability to make an informed decision on big-ticket items such as furniture and cars. The mobile phone already acts as a wallet and currency enabler in more progressive mobile markets such as Japan and Europe. As we progress further toward this, the phone will become an ID, and its electronic signature may be useful for creating consumer lists. Using your Mobile as a way of purchasing goods is a trend cropping up in markers beyond North America. It opens up interesting opportunities for making business simple and building affinity programs. Expect to see things such as RFID cropping up here with phones. Mini drivers have already experienced personalized ads triggered by their key fob. That sort of thing can done with relative ease once phones can be used as a form of passive electronic ID. GPS and location-aware applications are starting to gain traction. A "digital companion" is an application that helps you out. They are bits of software that can learn certain things and can respond to their environment. Some examples: As you pass by the dry cleaners the phone beeps to remind you of stuff you dropped off; as you enter the grocery store it automatically picks up your list of things to get from the web. Digital companions are a form of software called expert systems. They help us do the little things, and they can be developed to help foster a relationship between a company and a consumer. Most of the higher-end phones now allow you to "side load" information, which is the ability to sync information from a PC. Since we have reached a point in technology that has allowed us to view relatively high-quality video on a small screen but are stuck at an economic point that makes downloading large files far too expensive, more and more rich content will be downloaded through home networks and synced to a phone. Side loading creates opportunities for enterprising marketers. I'm a sci-fi fan, and if I could sync some video to my mobile device daily, I'll even watch the ads, especially if I don't have to pay exorbitant carrier charges for the privilege of downloading. In fact, I'll even go so far as to provide some personal information so that my daily sync can contain some advertising that may actually be relevant and interesting to me. Ultimately, what needs to change is the pricing structure of the wireless carriers, but in the meantime, providing consumers with phone-friendly video content will go a long way toward reaching the on-the-go consumer. When we talk about mobile marketing, the compulsion is to talk about fancy internet and software applications, but we often forget about plain old voice. Voice is the killer app for a phone, and it's also been all but completely overlooked as a form of mobile marketing. Every cellphone user has access to it; speaking is a standard feature on all cellphones. We don't have to worry about protocols, hardware or compatibility. I would love to be able to walk into a bookstore, call a number and listen to a quick review of the most interesting books recently released. It would be really useful to walk into a grocery store and listen to a quick recorded voice with some healthy dinner ideas or a wine store with smart suggestions. The possibilities are endless. Voicebots are a low-tech way of doing mobile marketing right now in a meaningful way. Mobile marketing is starting to become a brighter light on the horizon. It just took some time for the hardware to actually catch up with the possibilities. Apple changed the game by finally creating a canvas that, above all, inspires people to think about the possibilities. With the new technologies headed toward us, mobile marketing ideas will soon be able to bypass many of the difficulties we have faced in the past because of restrictive networks and high fees, SMS costs, expensive, wireless data fees and a host of other problems here and there. These obstacles are being addressed by the technology, and hardware trends are shifting the control of content and network access -- which the carriers have always dominated -- back to the consumers, and that above all is the biggest potential boost to mobile marketing. Mobile marketing's day in the sun is almost -- but not quite -- here. Change is good, imagination is better. Have fun thinking and inventing. The universe is the limit.